Adsense Ninja - Boost Your AdSense Earnigns! Stop losing money on AdSense – Increase your CTR and RPM in Minutes! AdSense Ninja WP Plugin is developed by an AdSense Optimization Expert, with one goal – make you more money! It is based on 10 years of extensive AdSense optimization experience and data, and over $400,000 in AdSense revenue! Bottom line – we know AdSense, and this is the best WordPress plugin for Google Ads! 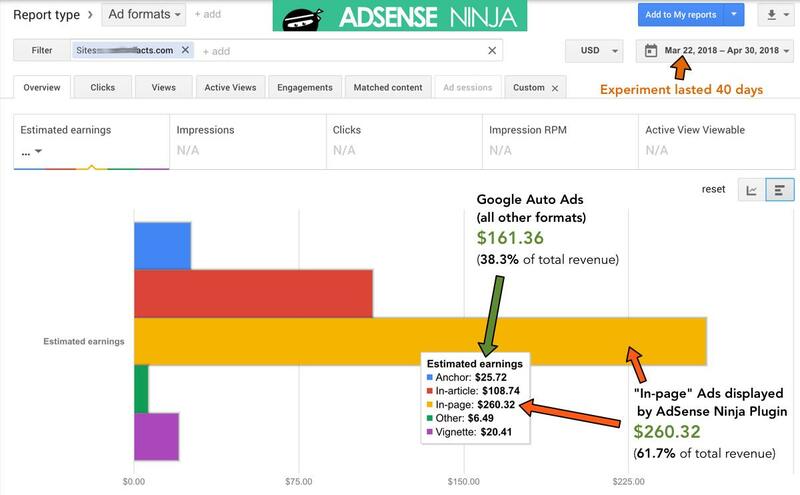 AdSense NINJA Beats Google Auto Ads by 61 percent! Display Ads Above & Below Content on All Posts & Pages! Easy Intuitive Ad Placement Dashboard! Optimized for Higher CTR (More Clicks = More Earnings)! Improve Mobile & Desktop earnings. Disable Ads on Individual Posts & Pages! A/B Test different AD sizes / colors / formats. Get Access to Exclusive Video Guides on Ad Optimization! Place Ads Inside WordPress Comments & In Sidebar! AdSense Ninja plugin will pay for itself within 1-2 months* in Extra AdSense revenue, and you will be making more money going forward! Ads Ninja plugin is the result of over 10 years of AdSense optimization and ad placing. Each ad placement was tested on millions of pageviews, and has show an increase in RPM of 30-50% or more! Most Adsense plugins are made by developers who are good at coding, but don’t understand the needs of an AdSense Publisher like yourself. You use AdSense to make money – so why use plugins that are built by developers with no AdSense experience? AdSense Ninja gives you the essential, yet most powerful ways to display ads on your blog, in the positions where it will make you most money, as well as flexibility to have ads optimized for MOBILE. We feel that publishers don’t need a long list of useless features, but only the features that will increase your earnings. We built this plugin for our internal use, with simple goal – make ad placement easy, and optimize for higher Click-Through-Rate! There are no useless features! AdSense Ninja plugin was created by a seasoned AdSense expert with over 10 years experience – not by WP plugin makers who only know how to code! All your ad placements are intuitively organized for quick AdSense deployment. Simply paste your Ad Code for Desktop & Mobile Ad into each placement (such as above, below or inside content, or between comments). Next, select if you want to show this ad on ALL Post and/or Pages, and click SAVE. Your ads will display immediately. If you need to disable ads on certain pages, it is very easy to control them inside the WP Post/Page Editor. It very easy to put Google ads across your entire site in less than 10 minutes, show Device Specific Ads (optimized for Desktop and Mobile). AdSense Ninja plugin has only the Most Essential features to help you quickly deploy Google Ads (or any other ad network) and start making money! Powerful, yet Simple AB Testing made to increase your Income! We built this CORE feature into AdSense Ninja Plugin, because we saw the power of testing different ad formats, and found that certain Ad Sizes can make as much as 138% more money! Without testing these ads, we would have never known this, and would be losing money for several years now. We don’t want you to lose money! That’s why we recommend that you test your ads, using simple AB Testing feature. Just compare to ad units against each other in the same placement, and after a couple of weeks, you will see which ad makes more! The true power of AB Testing comes in ability to run experiment in EVERY ad placement, independent of each other, both on Desktop and Mobile! When Auto Ads came out in February 2018, I began to have second thoughts about my plugin – what if Google’s machine learning AI is better, and all my work was for nothing? What if it’s just that simple – put one piece of AdSense code between <head></head> tags, and you are all set? AdSense Ninja Plugin beat Auto Ads by a whooping 61.33 percent over 40 days of testing!!! So all the popular YouTubers, who were telling me “Auto Ads is a BIG DEAL” and “Auto Ads increases revenues by 20%” where WRONG! They just don’t know how to optimize AdSense and are losing tons of money! Designed based on over 10 years of ad optimizing experience, I made this plugin do the thing that I used to do by manually editing WordPress theme’s PHP code, and wasting hours trying to change one ad, across entire site! So I built this plugin for myself to use on over 20 WordPress blogs that I own, so I could quickly place new ads or change old ads. AdSense Ninja plugin is based on “Ad Placements” or most profitable locations on the website. Each Ad Placement has an option to display a Desktop or Mobile specific ad unit (ad size). This gives you freedom from Google’s poorly performing Responsive Ads, while still serving properly formatted ads for mobile users. This method helped me improve income on one of my investment sites by 104% within first months! You can place custom ads anywhere in content, on sidebar, or even inside your WP theme/template with a preconfigured short-code! I added an AB Testing to EACH ad placement! For example, you can test if a 728×90 Leaderboard Ad per performs better than 250×250 square ad, of if 300×600 large skyscraper ad makes you more money than a 300×250 rectangle in a Sidebar placement. See how it works (reload demo page several times to see AB testing in action). * AdSense Ninja will typically pay for itself within 1-2 months, by increasing your Site Revenue by 30-60% compared to Auto ads, assuming you currently make at least $250/mo on your single website, using Google Auto Ads, and switch to AdSense Ninja, as well as follow best practices of Ad placement and optimization. This is an great plugin, very flexible, easy to use. It’s expensive, but worth every penny. Will pay for itself with ease over a short period of time. Highly recommended.